How do you win customers back after you’ve violated their trust with a massive security breach? 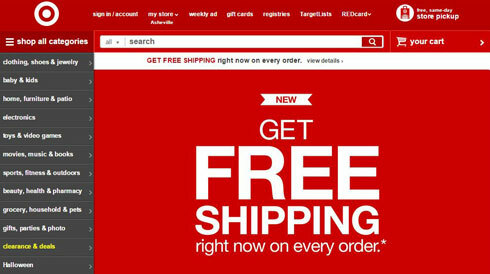 Target seems to think free shipping on everything will do it. Last Christmas, hackers invaded the company’s security and snagged personal information from approximately 70 million customers. When you violate the trust of so many people during your peak sales period, you have to make a spectacular comeback. Offering free shipping at a time that other companies are increasing their thresholds may just do it. People love free shipping. According to a July 2014 poll by Retention Science, shipping incentives in the form of free or discounted offers is one of the most effective customer incentives. A percentage off is the most effective discount cited by 30.9% of the US online retailers polled. Shipping incentives came in second at 21.8%. Age needs to be factored into because a separate study found that consumers under 46 prefer discounts while older ones prefer free shipping. The studies provide some insight but what really matters is the formula that works for individual companies. A company offering exclusive products, good customer experiences, and exceptional value doesn’t need free shipping to be competitive. The trick is finding what works best for your company. The copy shouts “GET FREE SHIPPING” followed by “right now on every order.” Except…orders that exceed standard sizes may have oversize handling fees and orders from Hawaii and Alaska are excluded. By the way, you can forget about getting free AND fast shipping because the free version only includes standard delivery of 3-5 days tacked on to the 1-2 days processing time. Surprise charges trigger cart abandonment issues. Slow delivery around the holidays creates call center nightmares. The problem many small retailers have is a failure to correctly identify the competition. A small to midsize business cannot compete using the same benchmarks as the big-box companies. The differences between your company and large brands have to be clearly defined, communicated, and the foundation of the business. Your customers’ shopping experiences determine your company’s success. Don’t panic – Your customers choose your company for a reason. If you have been taking care of them over the years, it will take more than free shipping to lure them away. 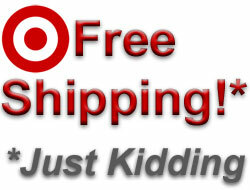 Be realistic: Target’s free shipping policy limitations makes competing with them easier. If you negotiate well with your carriers, you might be able to offer an even better deal. Offer shipping alternatives – Timing is everything in the shipping business. People who wait until the last minute to order expect to pay more. Providing options for fast shipment and delivery can trump lower costs. Provide exceptional value – Evaluate your shipping costs carefully so you can effectively offer great value to your customers. When possible, build some of the costs into the product price. Be available – People always have more questions when they are shopping for holiday gifts. Having a responsive, friendly customer service team available to quickly answer questions via email, telephone, and social media builds trust and wins customers. Manage inventory well – Hot items go quickly during holiday season. The “need” to acquire high demand items supersedes shipping cost concerns. Managing your inventory well can create an environment where new customers find their way to you after others are out of stock. Improve your analytics – The free shipping incentive from Target most likely will not have an effect on your business but it pays to be sure. Monitor customer behavior and activity to insure that there are no unpleasant surprises lurking in the background. Have fun – It’s the holidays. Make it special for everyone in your company. Your team members’ enthusiasm will spread to your customers. There will always be companies that offer something that is not economically feasible for your business. Fortunately, most people do not choose the companies they patronize by cost alone. Other factors like convenience, ease, selection, and customer care have a much higher effect on the selection process. When you focus on the things that make your business unique, competitor activity has little effect. For information on how to effectively compete, email Debra at dellis@wilsonellisconsulting.com.